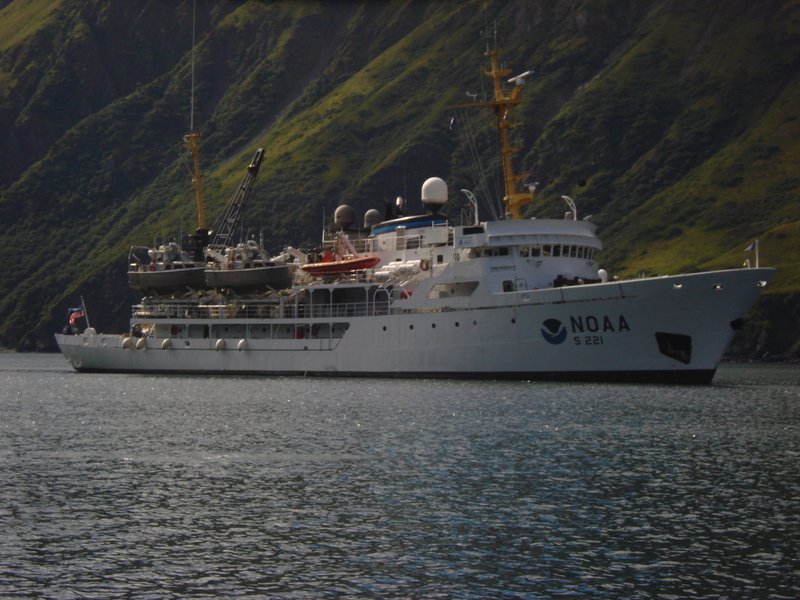 NOAA ship Rainier anchored in Japanese Bay. Since my last blog, we have come and gone from Japanese Bay, and moved on to Terror Bay. As we were coming into Terror Bay through a narrow passage, we all got a dangerous reminder about how important hydrographic survey work is. The nautical charts used to map our route into Terror Bay showed a depth of 25 Fathoms (150 feet), at a specific point we were traveling over. The actual depth at that point, however, was only 7 Fathoms (42 feet). That is only one third of the depth that was charted. The Rainier’s draft is slightly over 14 feet (the depth from the waterline to the bottom of the Rainier’s hull, or bottom), so we were safe traveling over the 7 Fathom location. Seeing this big of a DTON (Danger to Navigation) from the nautical charts to the actual depth, however, could be a cause for alarm. How many other measurements are wrong? Can we safely get the ship back out of Terror Bay? With these thoughts in mind, one Launch boat was sent out today to survey and recon (explore/inspect) Terror Bay and ensure that we have a safe path out! Gauging sea level is trickier than just sticking a ruler or tape measure in the water because ocean waters don’t have one steady level. Tides and currents constantly flow up and down, causing tides and water levels to be very important for hydrographic survey and other work at sea. 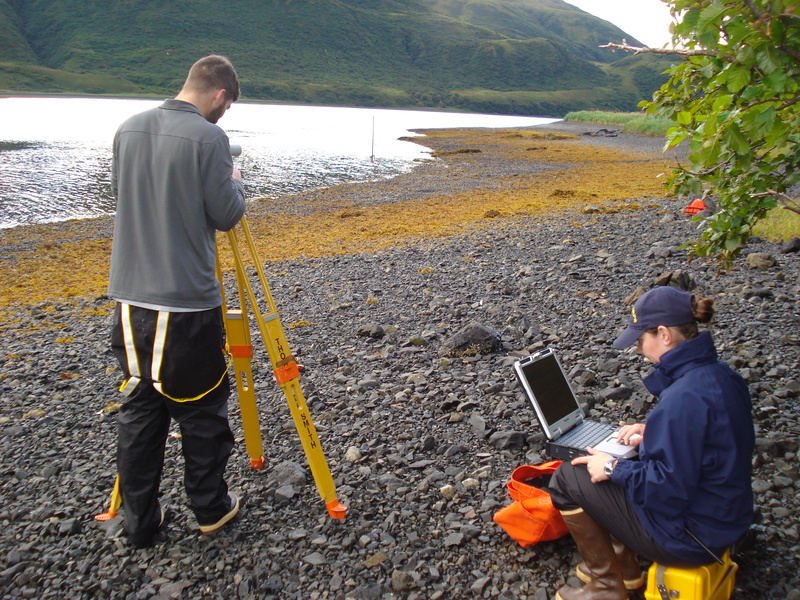 Hydrographic surveys are conducted at all different levels of tides. 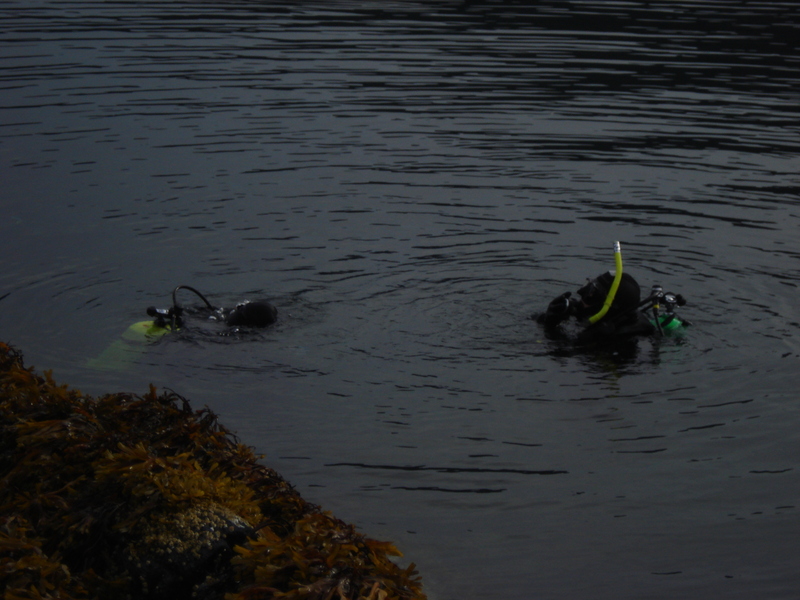 This means shoal areas, rocks, shipwrecks, and other hazards are surveyed and recorded at all different levels of tides. After hydrographers survey an area, they bring all the recorded data back to the ship for processing. In processing, the depth around any hazards or dangers to navigation must be corrected based on the changing water levels. 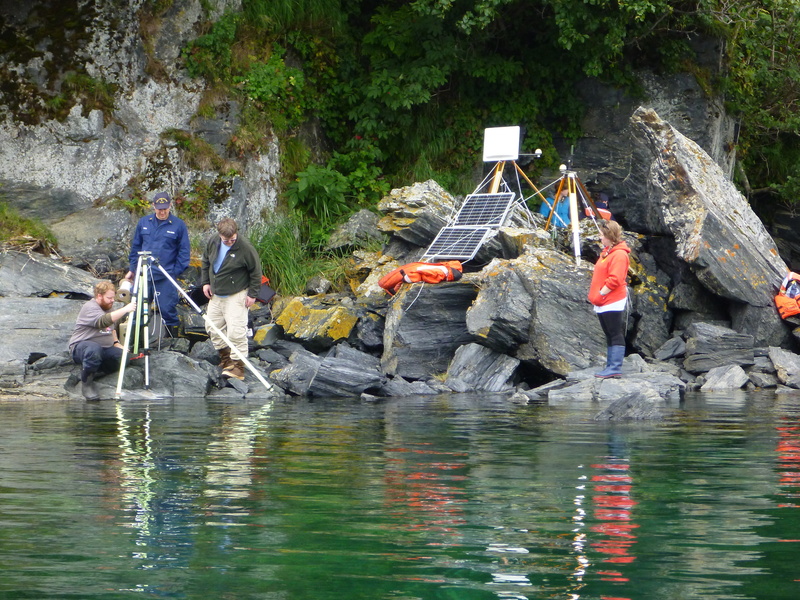 In order to determine the necessary changes due to tides, tide stations are set up near survey areas. To set up a tide station, a team needs to go ashore near the area to be surveyed and explore- looking for good, stable, permanent places (like bedrock) to install tide gauges and a tide staff. After an area is identified, a team is sent to install benchmarks. Benchmarks for tides are like those that can be found at national landmarks and mountain peaks. Tidal benchmarks are multipurpose: they provide a frame of reference to ensure the tide staff and tide gauge orifice are stable (not moving relative to the land), they allow for comparison data in later years if we return to survey or work in this area again, and they provide stability data (the Earth’s surface, including under the oceans, is constantly changing). 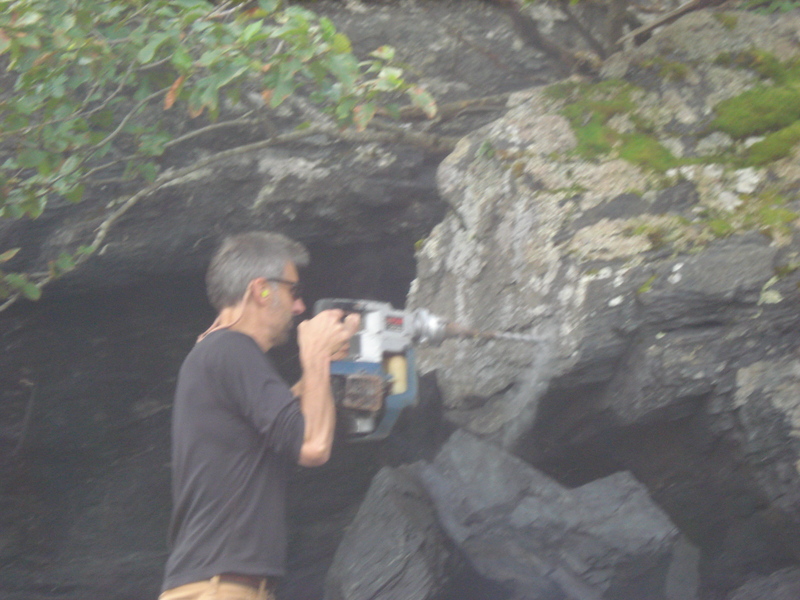 Senior Survey Tech Barry Jackson drill into bedrock, preparing to install a benchmark. 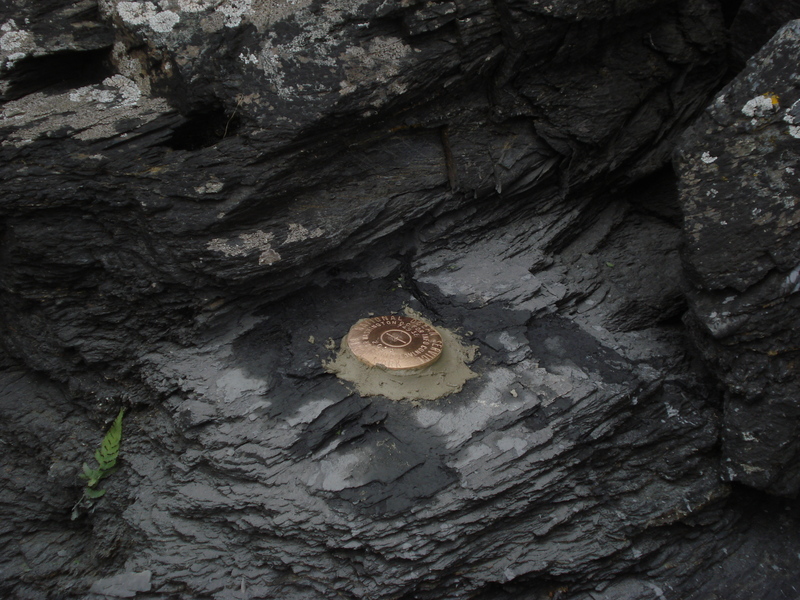 Here is a benchmark cemented into bedrock near the shore line. Along with installing benchmarks, a tide staff must be set up. 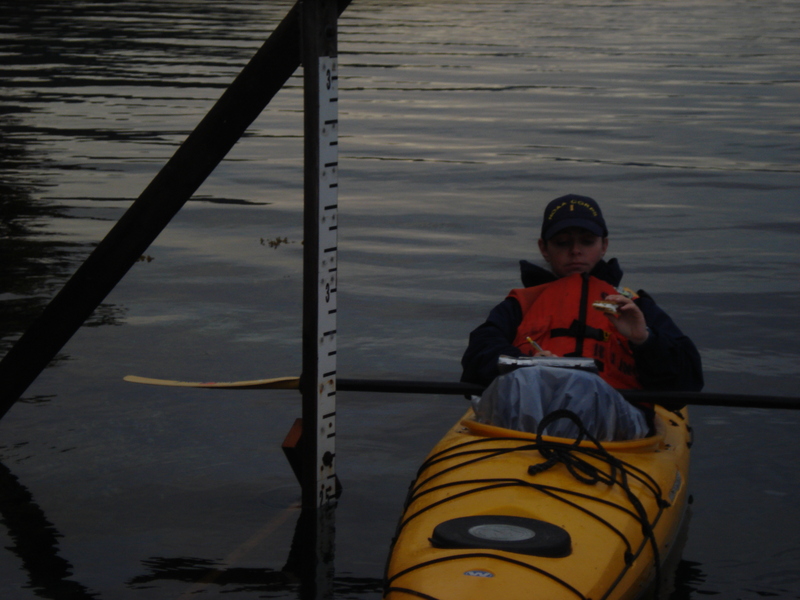 A tide staff is large meter stick used for both leveling of benchmarks and for taking readings on water depth over an extended period of time. After all instruments for the tide station are set up, the tide staff must be observed for several hours. While observing, the water level must be measured with the tide staff and recorded every six minutes. This data will then be compared with the data gathered by the tide gauge instruments, and hopefully, will match. Cheif Survey Tech Jim Jacobson and Assistant Survey Tech Thomas Burrow install the Terror Bay tide staff during low tide. ENS Micki Ream reads measurements from the tide staff during higher tide. 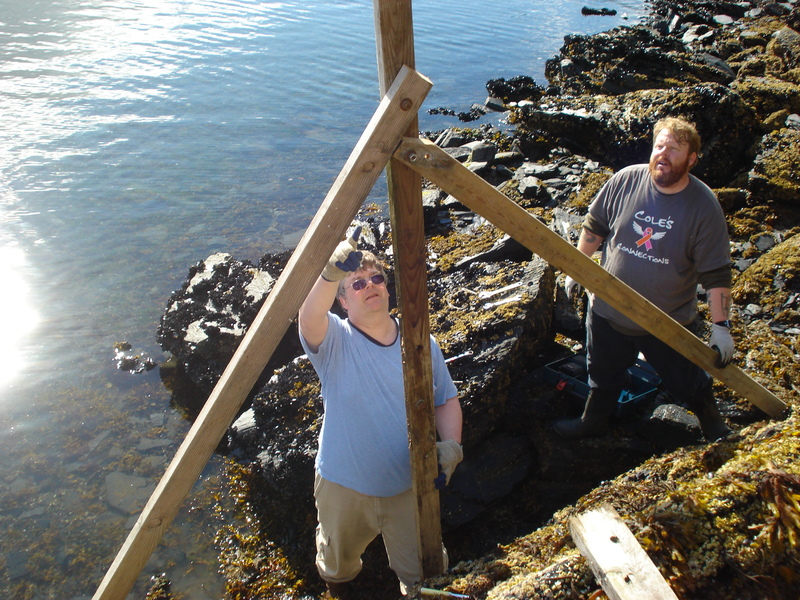 While benchmarks and a tide staff are being installed, often another team is working to install the tide gauge. Tide gauge stations are instruments used to measure the change in sea level, over time. They are powered by solar panels and include tubing and a sensor that must be secured under the water by a dive team. The sensor, or orifice, must be placed on the seafloor, and anchored there, where it will always be underwater, even in low or negative tide. The sensor uses air pressure, from a pump on shore, to measure the water depth. Dive Master ENS Katrina Poremba and Diver ENS Micki Ream work to weight down the orifice tubing and anchor the sensor to the seafloor. Once everything is set up, a team will do a leveling run to measure the height of the benchmarks relative to the tide staff. Meter sticks are held level at each of the benchmarks. 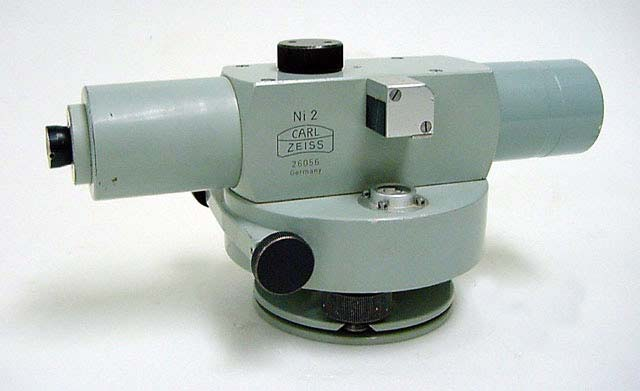 One person then reads a top, middle, and bottom thread measurement from each benchmark through a special vertical level on a tripod (kind of like a telescope). Benchmarks are measured and compared from A to B, B to C, C to D, D to E, and the primary benchmark to the tide staff. Then, these are all read again in a backwards run to double check and hopefully close the deal. Assistant Survey Tech Eli Smith sets up for a level run while ENS Micki Ream prepares for data collection. This is the level, put on the tripod, that allows Hydrographers to take vertical thread measurements from each benchmark. Survey work nearby can now begin, because hydrographers will have the appropriate tides data to make necessary corrections to the depth measurement gathered by the survey launches in the area!